For the last few decades days I have been struggling with making a semi-formal party dress for KT to wear to her Ninth Grade Party. It’s a big to-do that all the kids look forward to being able to attend at the end of their junior high school years. I tried to convince KT to let me take her shopping at the mall (ack!) and we could pick one out for her. We could even bring her friends and make a day of it. But nooooo, my girl wanted me to make her the perfect dress. I am truly honored to be asked to make this dress, but…well…it ‘s sooooo much work. It took us eons to find the perfect pattern. The dress had to be “twirly” so that it would flare out when KT spun around. It also had to be very elegant. Despite the fact that we went to three different fabric stores, there simply wasn’t enough of the “perfect” fabric color to be found. (It tickles me that my child was in search of the exact same color I used for our wedding!) We finally settled for a teal blue in a soft fabric. Honestly, the pattern didn’t seem too complicated. Maybe a little challenging in spots, but nothing I wouldn’t be able to handle. Note I said it didn’t seem too complicated. I have been struggling with this so much that I think the seam ripper has become part of my hand. Tonight, I was yet again working on the dress, while KT sat at the table beside me doing her Spanish homework. (although somehow, I think I may have ended up doing most of it through our conversations) I kept walking back and forth from one side of the table to the other to retrieve my pin cushion or seam ripper. I finally announced that I wished I were able to just utter some spell to make it come to me. KT told me all I had to do was call it in Spanish. So I told it to come to me. KT just shook her head and reminded me that I had to call it by name. Instantly, I named my pin cushion “Madge” and called it to no avail. I just laughed at her and walked around once again to get it. After a bit of muttering to herself and flipping pages of her Spanish book back and forth, KT finally announce “Cosa Alfombra Redondo”! When I looked at her in bewilderment she proudly told me that it meant pin cushion in Spanish. The she sheepishly added “kinda”. (Interestingly, calling it a “round carpet thing” didn’t seem to make it obey either). Note that nicely organized the pins are. I do my best to keep them all jumbled up and sticking out. It drives KT nuts and she keeps “fixing” it for me. This entry was posted in It's all about me!, KT, Random stuff. Bookmark the permalink. You are very creative. Making a dress is hard for me ;p.
Cute pin cushion. You even arranged the pins by color. The dress looks like it is going to be gorgeous! Great color choice! I can’t wait to see the finished product (*wink* *wink*). You really are quite talented! I like the Pin cushion! HAHA! KT strikes again, huh! I can’t say much, though, I have recently been on a “Coloring” spree, and have been mocked for the fact that I have to have my crayons all in order (by rainbow standard filing, of course) before I start coloring. It seems that there are some little imps that alos enjoy coloring and keep messing up the order of my crayon box! Sigh! Wouldn’t it be great to have a magic wand and fix everything Harry Potter style like clean all the dishes or make dinner appear, things like that? I would have fun with that. Oh my I would never attempt a formal dress! You have one great daughter there. 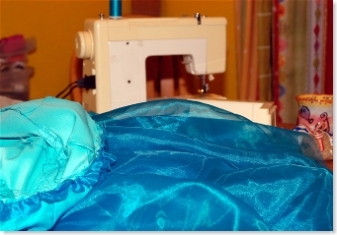 Most kids don’t want their Moms to make their clothes, no matter how talented. I have the same pincushion. My boys used to push the pins in too. I hate that! The pins NEED to stick out a bit so you can grab them when you need ’em. This is such a great post! 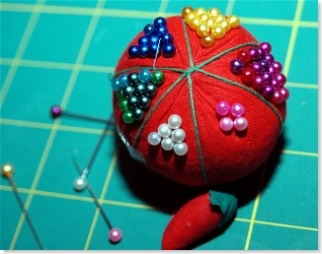 I love the neatly organized pin cushion. It cracks me up. Who knew a spanish pincushion was such a mouthful? Good luck at the mall! The very last formal dress I made for Sarah had a white satin top, fitted, with spaghetti straps and a navy velvet a-line empire style skirt. I learned my lesson on that one. That was the absolute last effort on my part. I took the top apart and put it back together so many times it’s amazing it was still wearable. My hat is off to you Susan for your stickwithitness! KT is a very lucky girl. I am looking forward to seeing the fininished product. The color and the fabric are beautiful. The pincushion cracks me up. The color of the dress is so pretty. I can’t wait to see it finished! BTW, I went to Shaun’s photo site–they’re amazing! WOW! I don’t hear of this kind of thing (…”sewing”…) very often anymore. What an amazing thing! I bet the dress will be georgeous. KT probably was able to be very creative and get just what she always dreamed of this way. You are adventurous! Lovely material. I have been sewing up a storm at my mum’s place today, and will be again tomorrow, I am so glad I have returned to doing something I love. Have you tried, “Accio Madge!” which is the Harry Potter-esque spell? No luck, huh? Ah well. Worth a try. Loooove the colour of the fabric. It’s going to go beautifully with KT’s colouring. Pictures when it’s all done, please! OMG, please do post a picture when it’s done! I’m salivating. You have my heart: you can turn a moment of life into a great story! Yes!!! I want to see a picture of KT modeling that dress! Yes! I want to see a picture of KT modeling that dress! Oh, that brought back such memories. My mom always made my dresses all the way through high school. When I got married I insisted she make my dress and she did. My sisters all had store bought dresses. I treasure the one my mom made and she has such memories of toiling over it sewing on all the pearls by hand. Perhaps if you’d called the pin-cushion something more Spanish? Marguerite perhaps? But, seriously, I greatly admire people who can sew. I always end up having a war on my hands whenever I sit down in front of a sewing machine. Like your pin cushion, they just don’t behave for me.